Central American Families Fear Deportation As Raids Begin Immigration agents are rounding up Central American families who entered the U.S. illegally within the past two years. They are mainly mothers with children whose asylum claims have been rejected. 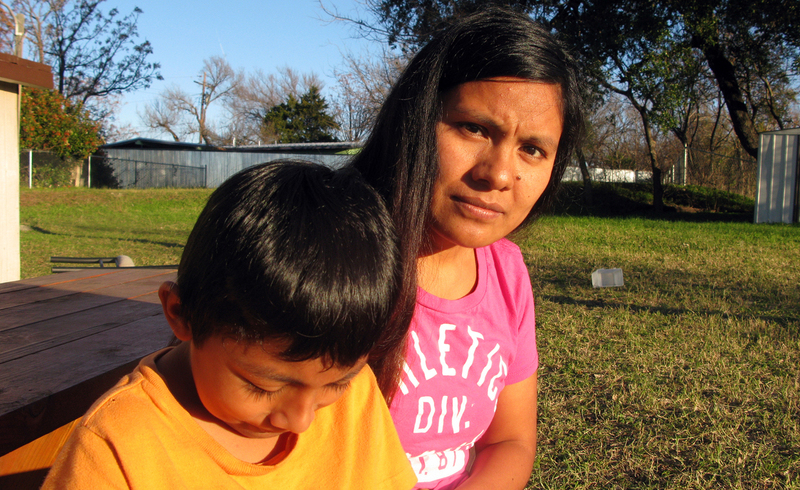 Hilda Ramirez and her son, Ivan, are staying at a shelter home in Austin. They fear that Immigration and Customs Enforcement agents will come and arrest them any minute. Hilda Ramirez, a 28-year-old Mayan mother from San Marcos, Guatemala, left Central America to flee her 9-year-old son Ivan's abusive grandparents. They crossed the Rio Grande in August 2014 and surrendered to the Border Patrol. They spent the next year and a half in an ICE detention center and here in this shelter home run by an Austin nonprofit. Both her and her son's asylum requests were turned down. "Every time a car stops on the street," she says tearfully, "I think it's them and they've come to take us away. I can't sleep. I'm very afraid." "I know there are many who loudly condemn our enforcement efforts as far too harsh, while there will be others who say the actions don't go far enough," Johnson says. After they're picked up in the current raids, immigrant families are taken to a detention center in Dilley, Texas, to await deportation. Ana Urias is there now with her four children, ages 3 to 17. "I was easy to find because of the electronic ankle monitor on my leg," says Urias, from a phone inside the building. She's a 32-year-old mother from Usulután Province, El Salvador, who says she fled because murderous gangs threatened her family. Urias says ICE agents showed up at the door of her apartment in Atlanta at 11 a.m. Sunday, but she wouldn't let them in. Then they called her and said they were actually there because her ankle monitor was broken. So she opened the door. Once inside, they told her to get her kids together and go with them. "They were very angry," she says. "They didn't give me a chance to do anything. I was in my pajamas and slippers. I said I wanted to call my lawyer. I didn't even have a chance to brush my hair. It all happened so fast. They fingerprinted me and took us to the airport. "When we got to the airplane, there were 20, 25 police waiting for four families," Urias continues. "Four women with our children. Why so much security? We're deportable families, not criminals!" Immigrant advocates are furious with the government. Though both women in this story had lawyers and still lost their asylum claims, advocates say that most applicants don't have representation and end up losing their cases. Cecilia Wang, director of the ACLU's Immigrants' Rights Project, calls the ICE sweeps an elaborate and unjust show. "The federal government is going to engage in fear tactics, storming into people's homes in early morning hours, in order to deter others," she says. But the borders "are not open to illegal immigration," says Secretary Johnson. "If you come here illegally, we will send you back consistent with our laws and values."